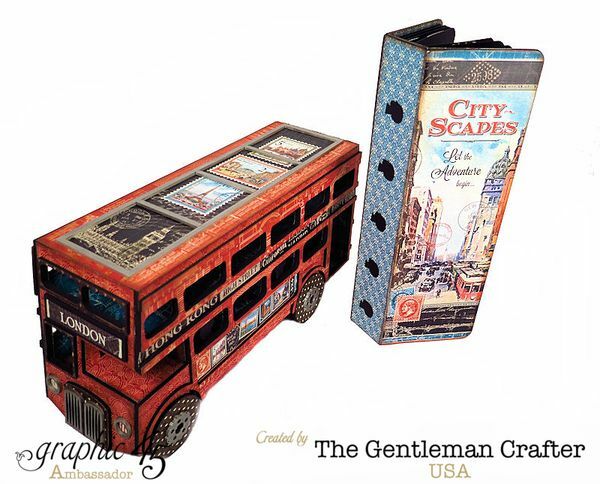 The Gentleman Crafter: Graphic 45 Cityscapes Inspiration Day! I would be honored if you would join me over on Graphic 45's Blog today as they are featuring an Amazing Travel Album by Danielle Copley and The Double Decker Bus created by myself. WOW! I now have rug burn on my chin because it hit the floor! Another Amazing piece. I fell head over heals when I saw the paper--it's my favorite release in a long time. It just grabbed me. THEN I see your fantastic creation with it. WONDERFUL!!!!!! This is AMAZING! I can't stop looking at the pictures on the graphic 45's blog post! Just fantastic! I echo everyone's sentiments. I don't know how you do it but I am so glad you do. Each and every of your project is just unbeliveably amazing! The creativity just seems to pour out of you! I love it! Congrats on your gorgeous work!